Recently, I came across an eighteenth-century ‘cure’ for rabies in a Dutch medical handbook, consisting of onion boiled with salt and honey. As I had recently been vaccinated against rabies for a trip to Asia and had been lectured by the nurse about the dangers of rabies, this recipe made me curious. 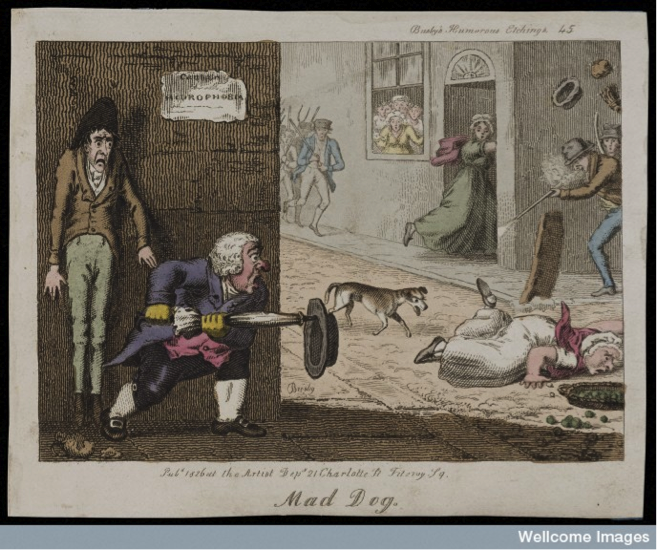 A mad dog on the run in a London street: citizens attack it as it approaches a woman who has fallen over. Coloured etching by T.L. 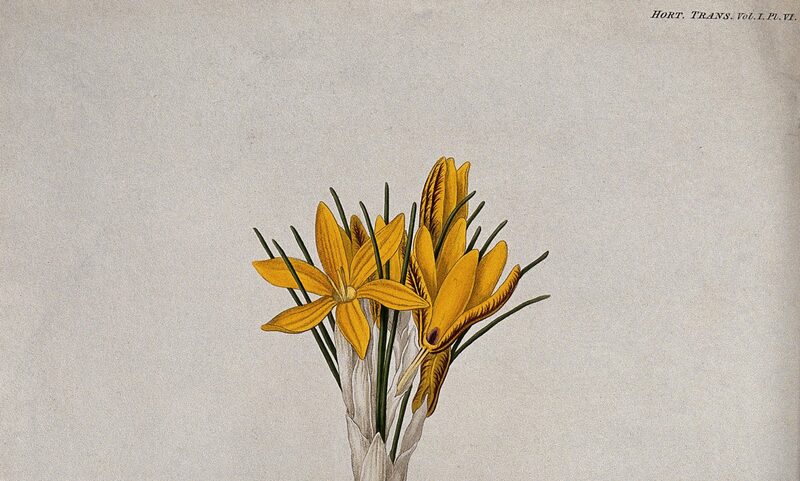 Busby, 1826. Wellcome Library, London. 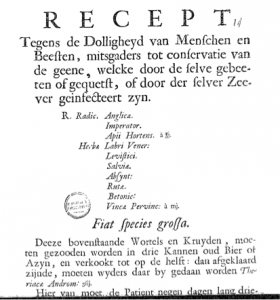 A quick search for eighteenth-century Dutch medical literature on rabies gave a surprising result: in the first half of the eighteenth century only two pamphlets and some general listings in medical and pharmaceutical handbooks occurred. However, around 1790 there seems to have been a sudden spike in the number of medical publications on the occurrence and treatment of rabies. It is difficult, if not impossible to tell what the reasons were. There may have been some kind of outbreak of the disease in the Netherlands at the time, or maybe the number of cases rose steeply in this period because of the increased popularity of pet dogs, as a recent German study has suggested. – A brew of ten different roots and herbs, boiled in three pitchers of old beer or vinegar. The wound should also be washed with it. – Drawing the poison from the wounds with ‘fresh earth, sand, mud or tobacco,’ and feeding the patient beer vinegar mixed with butter, combined with a strict diet and blood-letting. This author was so kind as to inform his readers about remedies that did not work too, such as May bugs in honey, mercurial rubbings, and wood beverages. – Three egg yolks, fried with three half-egg shells full of ‘tree oil,’ taken for two days and applied to the wound for nine. Sadly, none of this would have done anything to cure rabies. Until Louis Pasteur developed a vaccine in 1885, a rabies infection was invariably fatal. People probably believed the remedies listed here worked because not every ‘mad dog’ is a rabid dog, and many of the reports of ‘cured’ cases were made within days of someone being bitten. As it can take up to a year for rabies to manifest itself, depending on the location and the severity of the bite, people undoubtedly died of ‘hydrophobia’ months after a bite wound would have healed, thus missing the link between the incident and the disease. M. Noel Chomel, Huishoudelyk woordboek, Vervattende vele middelen om zyn goed te vermeerderen, en zyne gezondheid te behouden, Met verscheiden wisse en beproefde middelen (vertaling Jan Lodewyk Schuer en A.H. Westerhof). S. Luchtmans/H. Uytwerf, Leiden/Amsterdam 1743, 30. J.D.M. Cleve, “Verhandeling over den Dollen-Honds beet.” Vaderlandsche Letteroefeningen. A. van der Kroe en J. Yntema, Amsterdam 1792, 102-109. A.J.A. Looff, “Middel, alhoewel eenvoudig in zyn voorkomen, egter proefondervindelyk zeer vermogend eevonden, tegen de geduchte gevolgen van den Dollen Honds-beet, of de watervrees, op nieuw bekend gemaakt.” Vaderlandsche Letteroefeningen. A. van der Kroe en J. Yntema, Amsterdam 1790, 371-3. 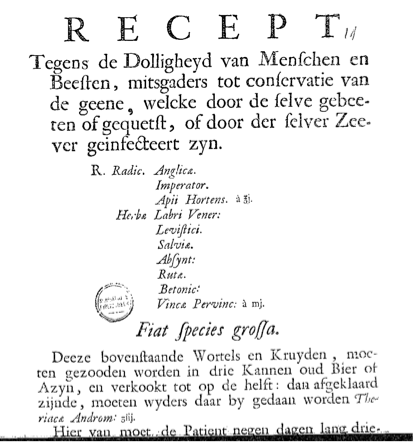 Advertisement for “Zestal van Tafelen, behelzende eene algemeene opgave der middelen tot redding in schielyke gevaaren, enz. Door Dr. A.C. Struve. Te Amsterdam, by A.B. Saakes, 1798.” in: Vaderlandsche Letteroefeningen. A. van der Kroe en J. Yntema en zoon, Amsterdam 1798, 583.